Crusted Port is a style of wine that was invented by English wine merchants when port was still being shipped in bulk and blended to their specification. It ceased to exist as soon as bulk shipments were stopped. There followed almost a decade before the Portuguese authorities reinstated Crusted port as a special category. Our Crusted Port is made up of the very best wines from two or sometimes three different harvests. It is kept in wood for up to two years and then bottled for further maturation. As this blend is not subject to any fining or filtration it continues to develop and mature in the bottle. Given sufficient time, it throws a thick sediment, otherwise called a 'Crust'. this is the English word from which it derives its name. 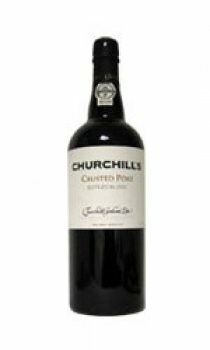 Churchill's Crusted, bottled in 1998 and aged in bottle in their cellars for a minimum of 3 years, is a full bodied port which has acquired the rich mellowness and dinstinctive 'nose' usually associated with mature Vintage Port. It can be consumed now or laid down for a few more years. The wine is sealed with a driven cork allowing it to breathe and the bottle to be stored lying down. Care needs to be taken not to disturb the 'crust'. When the bottle is taken from the horizontal position, it is best to leave it standing upright for a period of 24 hours prior to decanting. Crusted Port is even closer in style to Vintage Port than a 'traditional' LBV. It presents a dense, concentrated wine for far less than the price of a Vintage Port. In his tasting notes thier wine maker, Johnny Graham, describes it as 'rich and jammy, beginning to show the benefits of bottle age'.